Your body cannot survive without water and most of your bodily functions are dependent on it. It helps you process your food as well as flush waste from your body. Regular consumption regulates your body temperature, digestive system and other vital systems. It is recommended you drink at least eight glasses of water spread throughout the day. Usually we are concerned about getting enough water, especially when you have to exercise in a warm setting or live in a hot climate. But have you ever thought what happens if you drink too much water? While it is difficult, you can drink too much water. When you drink more water than your body needs and you are healthy, you will process it through your kidneys and eliminate it. 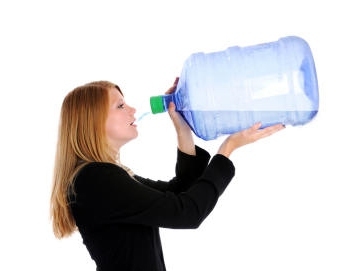 For women, a good daily intake of water is around 91 ounces. Some of it will come from the food you eat. If you drink more than that, you will probably have to go to the bathroom more often but otherwise it should not cause any problems. You would have to drink over two gallons of water in one hour before needing to worry about what happens if you drink too much water. There are two types of overhydration, sometimes referred to water intoxication. Usually there is a balance between urine output and water consumption, but when you drink too much you can decrease your sodium to dangerous levels. Increased water intake: When this happens, you drink way too much water than your kidney can process and eliminate through urinating. This causes the excess water to accumulate in your body. Retained water: If your body loses the ability to eliminate excess water, the water and sodium ratio in your blood can become unbalanced. This often happens due to a medical condition. When you drink too much water, your cells swell up from the extra fluid. This messes with your water and sodium ratio. Since your body works hard to maintain the precise concentration of the two, the water located outside the cell starts to pull sodium from within it. The process happens because your body is trying to restore balance, but unfortunately causes a drop in its sodium concentration. Your body also tries to create balance by allowing extra water to rush from outside the cells to inside their semipermeable barriers. By doing so, osmosis occurs because the concentration of electrolytes differs inside and outside the membranes. By allowing the two to cross the boundaries, the body hopes to bring the water and sodium ratios to their correct concentrations but in its efforts the cells can become too full of water. Sometimes your kidneys cannot handle the water overload. When they are working properly, they are a wonderfully effective method of filtration. However, when you drink more water than they can process, the extra water is pushed to regions where the electrolytes concentration is highest. Edema occurs, causing your cells to swell and distend. This reaction can affect any part of the body and is most noticed in ankles, feet, legs, hands and wrists. The body can still manage when these areas are affected, but can experience great stress if your brain cells begin to swell as well. Because it does not have the capability to expand as freely due to the constrictions of the skull, this can cause all types of bad reactions. You can experience headache, nausea, diarrhea, symptoms of heat stroke and vomiting. This can quickly escalate into respiratory arrest, seizure, coma and death. What happens when you drink too much water can be as simple as a little swelling to as severe as death. When water reaches dangerous levels in your body, it affects your body as if you are drowning. Since your cells are pushed to their limits and your sodium and electrolyte levels are out of balance, your heartbeat can become irregular, fluid can enter your lungs, and your brain may swell. Treatment must be administered right away to prevent permanent damage or death. Usually, we worry about getting enough hydration and have little concern for what happens if you drink too much water. Ideally, when you consume enough water through drinking or the food you eat, you will release about 6 cups or so of urine a day. It should appear clear or pale yellow in color. If you are not sure you are getting enough water, talk to your doctor about your concerns. He or she can give you guidance on how to determine if your body is getting what it needs. Drink one glass of water with each meal and another between each meal. Drink water before you exercise, during the activity and after you finish. To determine if you are getting enough water during intense exercise, you should see how much you weigh before you start and again after you complete the activity. If you lose more than 3 percent of your total weight, you should drink a little more next time you exercise. With that kind of body weight loss during an activity, you are coming close to dehydration. However, if your fingers and hands seem swollen or you have put on weight after a workout, you probably drank too much water and should taper it down a bit. One of the most reliable ways to determine if you need to drink water is your thirst. If you are thirsty, your body most likely needs water. Server responsed at: 04/22/2019 12:44 a.m.